Chester is about 12-18 months old. He has a happy, easy going nature. 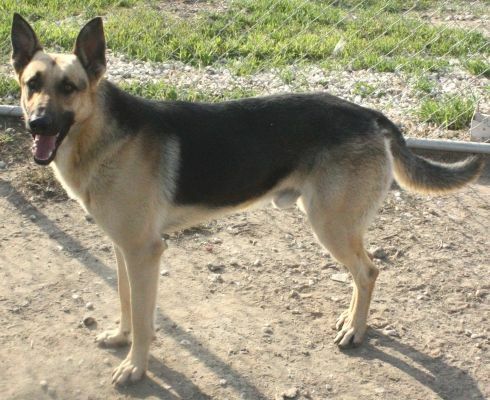 He is about 75 pounds, and is a medium-size male. 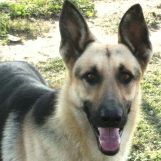 We know that he was found in the Bakersfield area with the female GSD in our program, Heidi Delano. He is housebroken and crate-trained. 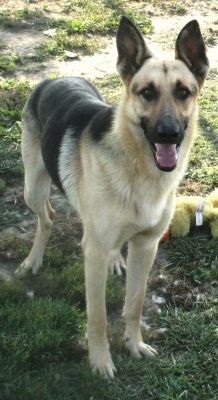 Chester loves other dogs and would be happiest with a compatible dog in his new home. Chester is relatively mellow and is very affectionate with both men and women. He is still very puppyish and can get into things although he has not torn anything up. He has a gentle mouth and he loves to sleep with his squishy toys at night.